If you are a comicbook connoisseur and live in the Atlanta area you might be pleased to know that artist Art Spiegelman will give a lecture on comics at 7:30, Tuesday, February 5, at Savannah College of the Arts (SCAD) at 1600 Peachtree Street in Atlanta. There will be free parking and admission. You can’t beat that! (unless they fed and paid you. 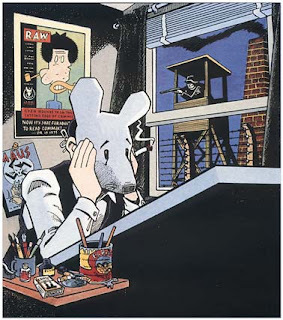 Art Spiegelman won the Pulitzer Prize for his Holocaust narrative MAUS, which portrayed Jews as mice and Nazis as cats. Spiegelman was contributing to THE NEW YORKER magazine and I read where he given the position as their cartoon editor. But, I don’t think it lasted. I have personally related to him because he and I share the same hero: MAD comicbook creator Harvey Kurtzman. He has done several tributes to Kurtzman in one form or another through the years. Spiegelman in very innovative and experimental when creating comics. 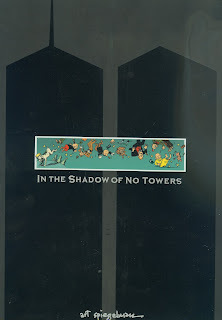 I have one of his books named IN THE SHADOWS OF NO TOWERS which concentrates on the horrors of the New York Trade Center Towers on 9/11 In the book he bares his soul just how horrible that act was and has a repeating theme about dropping the other shoe – when will they drop the other shoe? I still have not decided if I am going to hear his lecture or not. So is there free food? I love the old comic books but the newer stuff is crazy. Those oriental comics are very sexual of you have ever looked at them. I heard those Japanese comics were sometimes sexual, or kind of implied maybe. In our last movie we saw, "Juno" they talk about the heroin of a comic book, who is a teenager with super powers, who is also pregnant. I think they were referring to a real comic book character. If you can hear him for free, then you should go, nothing to lose. Stick some Nabs in your pocket, lol! Thank you for the Excellent Blogger award! I really appreciate it, as I just mentioned in your blog, I never won anything before but free trips or free luggage, all I had to do was listen to sales pitch... which we never did. I'll work at putting that icon on my sidebar - I might have to ask your installation advice, as I did years ago when I asked you how to make links. I went to your blog yesterday evening and found it very "excellent!" I love your photos and well, your text is great too.